Aaron Aranita has been a professional working musician for over 25 years. He has worked as a sideman and leader throughout the U.S. and Japan backing up some of the top names in the business, Bob Hope, Andy Williams, Natalie Cole, the Temptations, and Boy Katindig just to name a few. But that is only one aspect of his musicianship. He started in music young, playing the clarinet then switching to bass in high school, went back to playing woodwinds in college, and then picking up keyboards along the way. He honed his craft in colleges such as Leeward Community College near his hometown of Waipahu, Hawaii and Monterey Peninsula College in Monterey, California, and at dedicated establishments of musical learning such as the Berklee School of Music in Boston, Massachusetts. The Berklee School of Music was where Aaron decided to reach out even more and really learn from the best teachers available, Joe Viola for saxophone, Greg Hopkins, Phil Wilson and Andy Jaffe for arranging and composition. Evidently, he learned his lessons well because the people at Berklee to nominated him to the Dean’s List in 1980. Now, as an accomplished musician, he composes both music and lyrics, owns and runs his own commercial studio, Sugartown Records, where he produces and records his own and other artists’ albums, and even serves as musical director for the annual Great Hawaiian Jazz Blowout. He is also a well sought after accompanist among Hawaii’s finest. Aaron is an extremely accomplished musician in classical and jazz studies. Aaron plays all of the woodwind instruments and is a fantastic pianist and arranger. He likes to accompany his students in recitals which enhances their performances. If you take lessons with Aaron you are sure to be lead in the right direction to becoming a serious musician from beginner to advanced stages. Aaron Garcia is a musician, songwriter, teacher, and composer based in Mililani, Hawaii. Teaching guitar and bass since 2011, Aaron has found a passion for sharing his love of music with his students while helping them further their musical knowledge and proficiency. Aaron’s musical taste and playing style spans a wide variety of genres, including Rock, Pop, Blues, Folk, Reggae, Funk, Metal and Afrobeat. Though he had previously learned basic music fundamentals playing trombone in concert band, Aaron discovered a serious interest for playing music in 2003 at the age of 13, when he picked up the bass for the first time and taught himself how to play with the help of music instruction books, tutorial videos and the most helpful tool in his learning experience, playing with and observing experienced musicians. Two years later, he began to do the same with the guitar. Since then, Aaron has been honing his skills, becoming a well rounded musician and songwriter through the formation of his bands, Saving the Orphan and The Fresh Preps. While signed to World Class Sound, Saving the Orphan released their debut album, Reality, in 2012, in which Aaron was not only the lead guitarist, but also played a large role in the overall songwriting, composition, and production. After they had finished the album, the band had the opportunity to perform on the same show/bill as national artists, Switchfoot and One Republic. In 2013, Aaron decided that he wanted to take on another project that would would eventually become a multi­vocalist Pop/Rock band called The Fresh Preps. Their first single, Don’t Ask Me Why, was written by and features Aaron on lead vocals, guitar, and keyboards. Aaron has also been involved in musical projects elsewhere, including live and studio session musician work, branching out to styles such as Country, Traditional Hawaiian, Blues, Funk, Reggae and Bossa Nova with acts including the Colby Benson Band and STARR Kalahiki. He has also taken on work with musical theatre orchestra pits at Manoa Valley Theatre, Leeward Community College Theatre, and Hawaii Theatre. Aaron has a very quite and mild personally, but is a awesome and qualified music instructor. Fundamentals are important to Aaron but he is very flexible to charter to specific students needs and desires. Not only is Aaron a great teacher, but he is an awesome performer who focus on island style music and the contemporary scene. Alexandra began her violin and piano studies at the age of 6 while growing up in Kazakhstan. She graduated with honors from the National Music School for Gifted Children where she obtained a diploma in performance and teaching in violin and piano While teaching, Alexandra never stopped learning. After moving to America, Alexandra pursued and received Master of Music Degree from DePaul University (Chicago, IL) and Bachelor of Music Degree from Kennesaw State University (Atlanta, GA). Alexandra was fortunate enough to have many great teachers throughout her life. Since she has received so many different perspectives of teaching in her studies, she has seen firsthand several teaching methods. This molded her into not only a good player, but a good teacher as well. Alexandra has been teaching privately for a little over ten years. She has been professionally trained to teach all levels of violin playing and beginner to intermediate levels of piano. As a violinist, Alexandra has been the concertmaster of DePaul Symphony Orchestra, DePaul Opera Theater, and Kennesaw Symphony Orchestra. She has also performed with Hawaii Symphony Orchestra, Civic Orchestra of Chicago, Ludwig Symphony Orchestra and Georgia Symphony Orchestra. In 2011, Alexandra traveled to China as the concertmaster of the Kennesaw Symphony Orchestra for a three-concert tour that included a performance at the Central Conservatory in Beijing. Before moving to Hawaii, Alexandra maintained a large private studio of violin and piano students in Chicago. She also taught violin group classes at several elementary schools throughout Chicago area. Character Overview: Anjj has a unique teaching style, she is very dynamic and expressive in her passion for helping her students grow as musicians. Her students all absolutely love her and you can see the excitement in their eyes before and after each lesson! Please check the video out about to see for yourself why her students enjoy their lessons so much with Anjj. Casey is a local girl, born & raised on the North Shore of Oahu. She has been playing the piano since she was 6 years old, and still continues to take piano lessons to this day. Playing the piano is Casey's “first love,” and no matter how busy life gets, she always makes time to get her music therapy and pure enjoyment of life thru playing the piano and music. Since “home” is Waialua, Haleiwa, Wahiawa, and Mililani areas, she felt it fitting to give back to the community through music and teaching piano. Casey has a BIG passion for working with kids, and is looking forward to making a positive personal impact in lives of her students. She has been teaching piano and voice over a decade, and believes that regardless if you are naturally talented or not ... with a hard work and dedication, the sky is the limit. Charmaine is a fun loving and positive instructor, who always has you feeling happy and gratified at the end of your lesson. She has a very rhythmical approach to teaching, that creates a strong connection with all her students. Charmaine does exceptionally well with children in the ages ranges of 5-8 years old, and as well with teens. She is a long time instructor of our studios and is a very reliable and present music instructor. Cris was born in Jakarta, Indonesia. Since his childhood, he had great appreciation and talent for music, and started learning classical guitar at a young age. It wasn't until his late teenage years that he really found his passion in playing & studying drums. Cris spent many years studying with great teachers such as Bill Larson and Jimi Bauchat, the founder of Colorado Music Institute, one of the most exclusive music schools in Denver, CO. He also studied with Paul Romaine a well-known drummer of the Woody Herman band. Cris' ability has been demonstrated by performing with Latin bands, Jazz ensemble, Funk, Rock, Hip Hop, Heavy Metal and much more. As well as worked as a studio musician, with several recording sessions under his belt. Today, Cris plays and performs with a few bands throughout Oahu and also focuses his time and energy to teaching the art of musical drums. As he would say: “Drums is not only about technique but about making melody and music with your drum pieces." Aside from drums Cris enjoys, and values spending quality times with his wife and two children. Curtis has taught all ages at all levels of experience and brings a broad knowledge base to his music teaching. Curtis teaches a broad spectrum of music from traditional song, thru Blues, R&B, Rock, Reggae and up to the latest and greatest from Bruno Mars, Meghan Trainor, Pharrell Williams, etc. Curtis attended UCLA where he received his Bachelor of Science with a minor in Music. Since then, Curtis has many years of studio and live performance experience and has played with many great musicians including Edgar Winter, Scotty Page (Pink Floyd), Lee Thornburg ( The Tonight Show, Joe Bonamassa and Rod Stewart), Jeff Baxter (Doobie Brothers and Steely Dan) and many more. Now with over a decade of experience teaching vocals, guitar, piano and drums privately in Los Angeles and now Oahu Curtis brings a vast knowledge with a fun and charismatic approach to learning and making music. Emily was born in Honolulu, Hawaii on October 20, 1991. At the age of 6, due to the inspiration of the movie, “The AristoCats” Emily started to learn to play the piano. While piano was her main focus, she also took lessons for swimming, tennis, and hula. Emily received the Teens Arts Achievement Award of Honorable mention in the year 2006. Emily also participated in the National Guild for 10 years straight always receiving a 98-99% of excellence. After graduating from her high school the Sacred Hearts Academy, Emily enrolled into the University of Hawaii. Soon after enrolling, Emily started taking classes in the music department to fulfill the requirements to receive a BA in the music major. Emily also took classes in voice because of her hobby and love of singing. Because her class did not have a piano accompanist, she took a part time job to become her class’ piano accompanist. From the teenage years, Emily had already decided to become a piano teacher therefore taking piano pedagogy classes in UH. Through these classes, Emily learned the importance of teaching and how it should be done. Since Emily is also bilingual in Japanese, she takes advantage of this skill to sing popular songs in both English and Japanese. Her dream is to one day go to Japan and to teach beginners how to play the piano. Emily is one of our teachers who has very high standards about dress and appearance for herself, and is great role model for children and teens. She is very straight forward with her communication, and has high expectations of her students with them having good technique, and practice habits. All her students respect her and work hard for her because of her high standards. She has been a long time instructor of our studio and is reliable and a very good teacher. Born and raised in Hawaii, Eric picked up the violin at the age of twelve. Eric joined his intermediate school orchestra and quickly became immersed with the instrument and for the next nine years, continued to make leaps and bounds of improvement. Upon starting his freshman year, he earned himself a spot in the Moanalua High School Symphony Orchestra – one of the most prestigious high school music ensembles in the state, known for three tours to Carnegie Hall. During this time, Eric also participated in the Hawaii Youth Symphony under the baton of former Royal Hawaiian Band director Michael Nakasone and also under the baton of Maestro Henry Miyamura. In his junior year of high school, Eric played in the University of Hawaii orchestra, as well as two other community ensembles. In the summer of 2012, he auditioned for the Ohana Arts production of “Oliver!” as a pit orchestra violinist. For the production, he played a solo for the song “Reviewing the Situation”.Eric currently plays in the Hawaii Pacific University Symphony Orchestra under the baton of Dr. Teresa McCreary. The HPU Orchestra has had the privilege to tour with award-winning slack-key guitar artist Makana – first debuting at Hawaii Theatre in 2013, and then on Maui a year later. On both occasions, Eric had the honor of playing a solo with Makana in one of his songs. Outside of orchestra business, Eric plays gigs for various college functinos and Honolulu events.Eric views music as an ongoing journey and still studies with professional violinists from Hawaii’s very own Honolulu Symphony. A tour de force in all areas of art and music, Eunice harmonizes both skills for her own creative pursuits. She majored in animation and digital arts, with a minor in songwriting, at the University of Southern California. Since elementary school, she’s been an extremely active church musician for praise band, soloing, ensembles, accompanying, choir, etc. Her main instrument is piano, but she also sings and does basic guitar and drums. Her life goal had always been art— specifically storyboarding, illustration, and/or concept art. But as music kept drawing her in, she now cannot deny that music must be at the forefront of her life. Confirmation of her musicality: Winning a children’s song composition competition, and composing the score to her own animated film, which received many recognitions from film festivals worldwide. Eunice currently works as music director and keyboardist at Pacific Revival Center, instructs art and music workshops, performs gigs, and other artsy things. Formally, she was a TV station’s Director of Operations, choir director, graphic designer, and freelance storyboard artist. She has begun her own indie musician ventures online, as “Eul” (artist name), as an artist who focuses on contemporary piano, soundtrack, singer-songwriter music. Unsurprisingly, Eunice also creates and handles all her promotional videos and images. Erika Hamano began playing music while growing up in Yokohama Japan, starting with piano lessons from age 6 and singing lots and lots of karaoke. At age 10 she started playing guitar, teaching herself from an old book of chords from the 60s and 70s. Upon moving to Hawaii before she started high school, she became interested in writing original music and is heavily influenced by the folk artists from the Woodstock-era and the alternative rock from 90s that she was raised on. She began composing and playing gigs at open mics and coffee shops around Oahu at age 15. Since then she has been a fixture in the Oahu local singer-songwriter scene, releasing her debut album called "Things to Break" on 'Aumakua Records in 2014 and has opened for acts such as Third Eye Blind, Matchbox 20, Mat Kearney, Meiko and Iron & Wine on Oahu and on neighboring islands. In 2013 she performed her single "Smoke Signals" at the Na Hoku Hanohano awards with an estimated 2500 in attendance. When she's not teaching she can be found performing around Oahu with her acoustic-rock band The Erika Hamano Band and is constantly writing new material. Erika has been a great asset to our studio as not only is she a good instructor, but she is very dependable and will definitely be there for your music lessons on a regular basis. She is easy going, and very likable, and she adapts to fit to the students needs and expectations. Erika has a passion to perform in which you can find her in the contemporary island music scene as a solo performer. Honybal Sosa (guitarist/composer) is a guitar performance major at the University of Hawaiʻi Mānoa. As a composer, he has collaborated on original scores and as sound designer for multiple dramatic productions including Leeward Theatre’s Clockwork, Kīkaha ka Manu, A Dark and Stormy Knight, and Tartuffe, and the Honolulu Theatre for Youth’s production of Duke. In 2015, he received a Poʻokela Award in the area of Sound Design for Clockwork. Honybal has performed alongside vocalist Starr Kalahiki at The Smithsonian National Museum of the American Indian in Washington D.C. (2016), and at the l’Université de Poitiers, France as a performer in the Festival À Corps (2017). For the past two years, he has volunteered as a songwriter for The Lullaby Project Hawaiʻi, a national endeavor facilitated by Carnegie Hall’s Weill Music Institute. He has been a longstanding member of Leeward CC Guitar Ensemble. Honybal currently works as a music tutor at Leeward Community College in the subjects of guitar, ukulele, and music fundamentals. Originally from Toronto, Canada, Jabari Prevost is a professional Saxophonist/keyboardist/bassist and producer. Jabari has a B.A in Music Performance emphasis in Saxophone and Jazz from Bemidji State University. In addition to being a jazz saxophonist (studying under Evan Cobb), he has extensive study in classical music studying under Steven Konecne, and Elizabeth Ruede. During and after his collegiate education, he has shared the stage with Jeff Coffin (Bela Fleck, Dave Matthews Band), Wycliffe Gordon (Lincon Jazz Center, Wynton Marsalis), Rashawn Ross (Dave Matthews Band, Jay-Z), Kiku Collins (Gloria Gaynor, Beyonce), Steve Smith (Journey, Vital Information, Buddy Rich band) as well as many other artists and clinicians. He has also performed at the BSU jazz Festival and JEN (Jazz Education Network) conference in Dallas with the Blue Ice Big Band. Jabari currently is based in Honolulu, Hawaii and is a freelance musician and producer. Jabari is a amazing contemporary musician! He is a great teacher with a mild temperament, whom easy to communicate with. Jabari not only plays piano, but his main instrument in which he plays extremely well is the saxophone. Jabari loves to perform, and teach music, heis a great addition to our music studio. Jeff James is a singer/songwriter/producer born and raised in Hawaii. He is the youngest son of the very well known jazz musician and teacher extraordinaire Chuck James. After high school, Jeff attended Hawaii Pacific University on a full scholarship to perform with the Hawaii Pacific University music program. After college, Jeff has continued his musical journey and made a name for himself in Hawaii, Japan and the Philippines with many of his songs appearing on radio, Netflix, and YouTube. He has appeared on famous TV stations throughout Philippines like ABS-CBN, GMA, TV5, and also, his song "Hawaiian Girls" received a Nahokuhanohano award in 2011. Now concentrating most of his time back on Oahu, Jeff is performing, recording and teaching and furthering his career in music. Jegaan Faye was born in Alexandria, V.A., he shortly thereafter moved to Japan at the age 3 and spent 8 years there. Jegaan also lived in Africa for a year and the Philippines for 4 years. Jegaan’s international upbringing is due to his mother's ongoing career as a United States diplomat for various U.S. embassies around the world. Having lived in Hawaii for the past 12 years, the majority of his work revolves around being an active performer in the local music scene all throughout Oahu. He’s performed in weddings bands such as the Island Kings Band and also performed for corporate events and private functions as well. Predominantly, Jegaan is a solo performer in the various hotels, malls, and restaurants in the Waikiki area. Venues such as The Modern Honolulu Hotel’s “The Study” lounge, The Moana Surfrider Hotel, Ala Moana's Mai Tai Bar, Sheraton Waikiki’s Rum Fire, the SurfJack Hotel, the Alohilani Hotel’s “Swell” Pool bar, and the like. Jegaan's music is a blend of jazzy acoustic contemporary pop renditions, up-tempo funk, and soulful modern-day crooning. Jegaan's aspirations are for excellence in his musicality, and in his performance career. His goals are to travel internationally with his band to exciting new places and to all the places he knew and loved as a child. Jerome, son of Chuck James has been teaching drums for well over a decade. He focuses on getting his students strong fundamentals as well as, developing their "groove". With his students, he sets a lesson plan that lays a solid foundation and game plan for their music career. 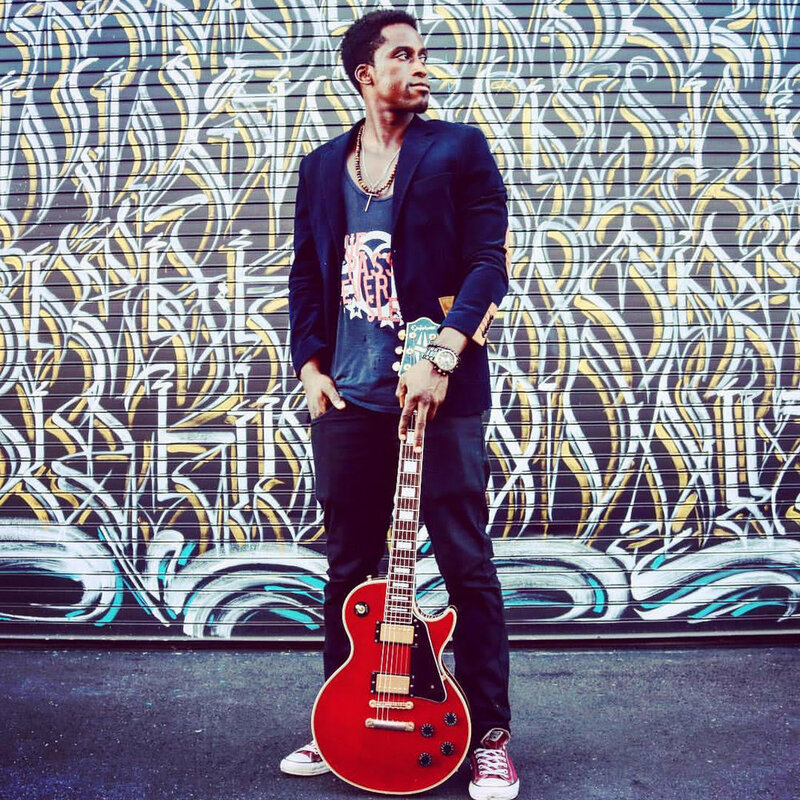 Jerome is professional gigging musician who has made a career in leading many different genres of groups as well as being a supporting musician. He currently runs his own recording studio as well as a drum repair shop where he fixes drums and makes custom drumsets. Jerome is a totally fun and loving person! He is very loud, and a vocally dynamic teacher with a unique teaching style. Not only is Jerome a good instructor, and drummer but he is my son whom I taught and I can personally vouch for his teaching ability. You will never have a dull moment in your music class with Jerome! Hard rock and heavy metal are the genres that initially inspired Joel to pick up the guitar. Once started, he developed interests in other musical styles, which led him to study music and classical guitar at Leeward Community College. He continued his education at the University of Northern Colorado where he received a Bachelor of Music degree in 2003. While having an appreciation for all styles of music, hard rock and heavy metal continue to be his main focus and inspiration. Johnathan De Soto Jr. is an alumnus of McKinley High School. In March 2016, he and the Symphonic Wind Ensemble I traveled to New York to play in the New York Wind Band Festival at Carnegie Hall. Upon performing, the band had earned a 98% marking, the highest score ever recorded in the festival history. After working with the head adjudicator Dr. William V. Johnson in April 2016, Johnathan earned himself a personal recommendation for any music college he decides to attend. Johnathan is in his 8th year of playing the tuba and has picked up the bass trombone, and euphonium. He also learns other brass instruments in his free time. Johnathan is currently studying at Kapiʻolani Community College and at the University of Hawaiʻi at Mānoa for his Bachelor of Music Degree in Tuba Performance. At the University of Hawaiʻi at Mānoa, Johnathan is the principal tubist with their Symphonic Band and the Symphony Orchestra. He also plays with the Hawaiʻi Symphonic Band, Honolulu Wind Ensemble, KCC Synthesizer Ensemble, and is a substitute tubist for the Royal Hawaiian Band. Johnathanenjoys playing with his fellow musicians and teaching and connecting with young musicians. He recently played a bass trombone, ukulele, cajón, and drum set quartet playing Jake Shimabukuro's "Orange World". His primary teachers include Alan Ing, Dr. T.J. Ricer, and Dr. Gabriel Arnold. Jon has been playing drums for 17 years. He attended Mililani high school where he played percussion in the concert band and marching band. He study drums with Chuck James for several years. After graduating high school he moved to California where he attended Los Angeles College of music for two years. There he studied under some of the best in the business with Joe Porcaro, Ralph Humphrey,Tony Alvarez and a number of other musicians. After graduating, he stayed in Los Angeles playing in performing in the local scene for a number of years before moving back to Hawaii in 2016. Joshua Kaleo’okalani Wells comes from a talented musical family, with a long history of kanikapila singers and musicians. Josh’s older brother, Ka’ili, has been an ukulele aficionado and protege for nearly 25 years, and has been a primary influence in Josh’s pursuit of music theory knowledge and instrument skills. Josh choose to pursue singing as his main instrument in order to support his brother’s instrument prowess. Josh played in multiple productions with New Hope Youth Performing Arts as a high school student, in such musicals as Moses: Prince of Egypt, A Charlie Brown Christmas, It’s a Wonderful Life, and Beauty and the Beast. In addition to his stage work, he won first place for Aiea High School’s 2010 talent show in his duet debut of “If I Ever Fall in Love, which in turn brought him to Brown Bags to Stardom, where he won second place male vocalist. After high school, Josh went on to study at Leeward Community College, taking up Classical Guitar under Peter Kun Frary, and performing in four guitar ensemble concerts in the process. Over the 2013-2014 school year, Josh studied Music Theory and Aural Training under Peter Kun Frary and Andria Tupola. In Fall 2013, Josh was a Bass in Leeward’s College Chorus under Kumu Andria Tupola, and had been selected as a soloist for “It Don’t Mean a Thing if It Ain’t Got That Swing.” In Spring 2014, Josh was a Bass/Baritone for Leeward’s Vocal Ensemble, and had the privilege to travel to Southern California to perform at Bakersfield College, Vanguard University, and Newport High School. Josh graduated with his Associate of Arts in Liberal Arts in May 2013. Currently, Josh is a student at the University of Hawaii at Manoa for Kinesiology and Rehabilitation Science. Outside of school and work, he is teaching himself how to play the piano and furthering his self-study in Music Theory. Josh believes in lifelong learning, strong foundation knowledge, challenging one’s limitations, and self-directed growth, and instills these values into his student’s musical prowess. Josh is a very like-able music instructor and works well with younger children, but just as well with older students. Josh communicates very effectively with his students and is a very patient music instructor. He is a multi-instrumentalist, who understand music from a broad spectrum but first and foremost is a very reliable and fun music instructor. You can take a lesson with Josh at our Waipahu or Stadium Mall locations. Juliette Alvey is a singer/songwriter who loves to share the gift of music with others. She grew up in the Los Angeles area and was surrounded by music in her home: her dad is a piano player and composer, her mom is a piano teacher, and her brother is a guitar player. She has a minor in music from Concordia University in Irvine, CA where she played bass in the praise band and sang in the choir. She has been playing bass, guitar, and singing in bands (as well as playing solo) since junior high and has a lot of experience leading church worship music. She is a trained Music Together teacher, which is an early childhood music and movement program. However, she enjoys teaching music to all ages and works hard to connect with each individual so that her students grow in their abilities and their love for music. Liz was born and raised in Korea and attended college in UK. She is well traveled and has had the pleasure of working in several different states and countries, including Hong Kong and New York. Liz spend 4 years teaching piano in Korea, and now has spent the last 3 years teaching here in Hawaii. She is a part-time piano teacher during day time and teaches art at night. Liz also plays piano at her local church, hospital, and school, and on the rare occasion at Ballet Hawaii and Tripler Army Medical Center. "Music is the most beautiful expression in sound and art is the most beautiful expression in silence, these opposite expressions are the gifts from God". Liz enjoys expressing beauty with improvising songs and creating art in her life. Her favorite musicians are Yiruma, Yuhki Kuramoto and Beethoven. Liz believes learning music and art leads can only lead to positive growth, and to added value in ones life. Lumi began playing violin with her 3rd grade class at Blue Oak Charter School in California. She took an interest in the instrument and began to take private lessons in 4th grade. After moving to Hawaii, she joined band for one year playing oboe at Highlands Intermediate and later orchestra at Moanalua Middle School in 8th grade. 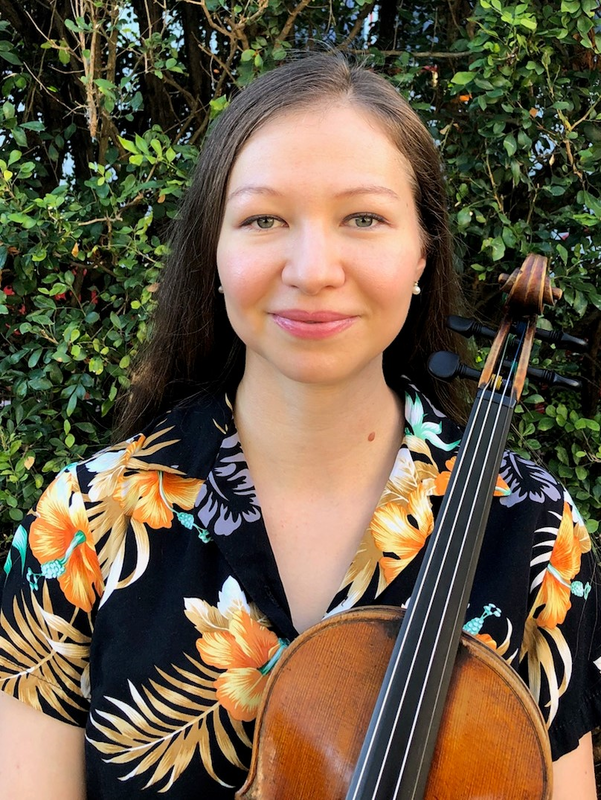 Lumi participated in Solo Ensemble Festivals throughout middle school and high school and was a member of violin group Na Mele O Suzuki led by Sheryl Shohet. In 2013, Lumi received Honorable Mention at the HMTA Junior Artist String Competition in the High School division. At Moanalua High School, Lumi was a first violin in the Symphony Orchestra and performed with the group at Carnegie Hall in 2013. She was also a member of the string ensemble Con Passione at Moanalua High School, performing at events such as Governor David Ige's inauguration. Lumi now attends Hawaii Pacific University and plays with the HPU Symphony Orchestra as well as occasional gigs including weddings and other community events. The HPU Orchestra has performed with artists such as Jeff Peterson and in 2017 the orchestra collaborated with Streetlight Cadence for a concert tour in Japan. Loukwha, graduated with a Major in Music, in Thailand in 2008. Since graduating she has been teaching private music lessons, which has now been for over 10 years. Loukwha later moved to Seattle and discovered a love for teaching music for early childhood. To further her passion in music for early childhood, she wrote a teaching curriculum and taught music and conducted several concerts at TLC Montessori school in Washington. December 2016 moved to the Hawaiian Islands but spends her time off exploring and enjoying the ocean. Loukwha's goal in teaching music is to continually strive to make music lessons fun, while delivering the days lesson. "Seeing my students grow with music keeps me passionate about teaching"! Karen is born and raised in Vancouver, B.C. Canada and her parents are from Japan. Karen Watanabe began studying piano at the age of 7. At a very young age Karen took piano and music theory exams through the Royal Conservatory of Music of Toronto. After high school graduation, she enrolled in the music program at Douglas College in New Westminster, B.C. and then onto the University of British Columbia. During that time Karen began teaching a few students, mostly young children as a student teacher. The number of students began to increase and eventually Karen was a mobile piano teacher. Kren also organized recitals and had students take RCM piano exams. After a while, it was time for a break. During the break, Karen worked in a Cancer clinic in Vancouver and volunteered as the piano accompanist for a Christmas Choir that performed once a year at the patients lodge. Later Karen moved to Hawaii. After living in Hanapepe, Kauaʻi for 2 years then moving to Honolulu, Karen’s back and ready to teach again! The most rewarding experience for Karen was starting students from square one, then watching them perform a difficult famous classical composition in front of an audience. “Having students enjoy piano playing is joyful and exciting”. Karen enjoy listening and playing music from Handel, Scarlatti, Beethoven, Chopin, Debussy, Ravel, Final Fantasy, J-Pop, and XJapan. Mike was born and raised in Southern California. He has a Bachelors in Jazz Performance from The Bob Cole Conservatory of Music, and a Masters in Music from University of Southern California. Mike was recently a member of the Disneyland band performing and entertaining weekly at Disneyland Anaheim California. He has just recently moved to Honolulu Hawaii to pursue his life goals of teaching, performing, and helping people. Mike specializes in jazz and commercial music, but loves teaching classical music. Mike is also a coach in the subject performance anxiety. Some of Mike’s extensive resume would include recording and performances from Hollywood to Dubai with artists such as Bob Mintzer, Tom Kubis, Arturo Sandoval, Jeff Jarvis, Queens of the Stone Age, and many more. Mike specializes in Bass trombone, tuba, tenor trombone, and euphonium, and as well teaches jazz improvisation, beginning theory, and beginning trumpet. Sign up with Mike, and we are sure you will receive great music education and lots of fun while learning! Mike: "I am here to make you love music, not a professional, but if that happens, that's the icing on the cake." trumpet, saxophone, clarinet, guitar, beginner piano, ukulele and voice. Michael is a multi-instrumental performer and educator from Chicago. His instruments include trumpet, saxophone, clarinet, beginning piano, guitar, voice, and ukulele. He graduated from Columbia College Chicago with a Bachelor of Arts degree in Music, specializing in Jazz Studies and Trumpet. Michael has performed in many bands and ensembles throughout his career and has shared the stage with Jon Faddis, Marcus Belgrave, Dave Douglas, Johnny Frigo, and Vincent Gardner, to name a few. He has been teaching instrumental lessons for over 10 years, with students starting as young as age five. In addition to performing with jazz ensembles, orchestras, and various bands, Michael is also a singer/songwriter, composer, and jazz arranger. Mike is a multi-instrumentalist instructor whom is well seasoned at all his instruments, and this is why we have chosen him to be our head instructor for group classes. He reliable, dependable, and has a great attitude that projects to his students. We feel very lucky and fortunate to have Mike on our team. Morgan Bernat is a voice and piano instructor who is studying vocal performance at the University of Hawai'i at Manoa. She has been singing professionally for 6 years and performed with her choir in Spain this past summer. She has played piano for 13 years and loves to work with young students just discovering piano. Morgan specializes in operatic/classical singing as well as the traditions of Broadway. She is well acquainted with the Italian, Spanish, French, and German languages. She is a part of Hawaii's Opera Studio in Honolulu and participates in many of the operas held at Blaisdell, the most recent being Eugene Onegin this past spring. Her goal is to cultivate music literacy and a love for music in her students. Olivia Meadows, (MM, DMA candidate, Arizona State University; BM, Florida State University) is a student, teacher, and freelancing clarinetist active in the Honolulu area. For four years Olivia served the Arizona State University clarinet studio as one of their teaching assistants, teaching private lessons, scale class, music education courses, and more. Olivia is a huge proponent of chamber music, with experience playing in a wide variety of ensembles including reed quintet, reed trio, clarinet quartet, wind quintet, sextet, and octet, etc. She has performed with professional orchestral ensembles such as the Phoenix Boys Choir and the Arkansas Symphony Orchestra. In July 2018, Olivia and her colleague Shengwen Wu performed the world premiere of a duo for two B-flat clarinets that they commissioned. Olivia is passionate about teaching and guiding her students towards being the most well rounded musicians they can be. Phillip Foster is a local music teacher from the windward side of Oahu. Phillip started studying music from a young age by taking piano lessons, playing the trumpet, and singing in choir. He continued to study music in private lessons, band, and chorus in middle and high school. He went on to study piano and voice at the University of Northern Colorado. After moving to Hawaii in 2009, he continued to study voice and piano, as well as the ukulele, guitar, and music education at the University of Hawaii at Manoa. Phillip has also appeared in a number of musical theater productions at Diamond Head Theatre and Paliku Theatre, as well as a few Opera productions with Hawai’i Opera Theatre. He has music directed and played piano for productions with the Performing Arts Center of Kapolei, DHT’s Musical Theatre Experience II summer camp, and Manoa Valley Theater. He has coached and given piano and voice lessons to students of all ages. Phillip has also taught after school choir programs at Castle High School and the Mid-Pacific Institute. Phillip is a very straight forward teacher, with strong fundamentals and basic concepts being extremely critical in his lessons. He loves theatre productions and is highly involved in the music production. Phillip is a multi instrumentalist who understands music from a broad spectrum. He has been a long time music instructor at our studios and has proven his reliability, music instruction skills and passion. Philip Simmons studied classical guitar at De Paul University, and graduated with Bachelor and Master Degrees in Music Composition. He has been teaching guitar for over 30 years. An orchestral conductor, he has appeared as guitar soloist with many orchestras under his direction, and performed with the Civic Orchestra of Chicago (training orchestra for the Chicago Symphony) at Orchestra Hall. An avid chamber musician, he has given recitals as far away as France and Italy. Mr. Simmons taught at Northeastern Illinois University and at Lake Forest Academy, a high school near Chicago. He enjoys giving guitar lessons to students of all ages and abilities, He played in a rock band as a teenager, and today performs regularly in Honolulu with “Penelope and the Day,” accompanying his seven year old daughter. Playing music has been Shawn’s passion for many years. Shawn has been musically inclined from a young age, playing drums and percussion since he was ten years old. He started taking private lessons from Chuck James before he entered sixth grade. In school, he participated in the band program for six years and played numerous drum set parts for concerts. Shawn was very involved in the music community and participated in many OBDA events island-wide throughout middle school and high school. At age 12, in his first year competing in Solo Ensemble, he received the highest award for his difficult snare drum solo, and continued to compete in Solo Ensemble throughout high school. He was the section leader of the percussion section in Select Band during middle school, and continued to participate in Select Band throughout high school. In his sophomore year, Shawn joined the Hawaii Youth Symphony and performed in many concerts throughout the season, including venues such as the Neal Blaisdell Concert Hall and Hilton Hawaiian Village. In his senior year, he became the leader of the percussion section, and received the “Most Outstanding Musician” Award in his band program at school. In his junior year of high school, he performed in the Select Jazz Band, playing a wide variety of genres in music, and played drums in the musical production “Oklahoma” at the University of Hawaii at Manoa, with many other gifted musicians and music majors. Outside of school, he played drums in a few bands with his friends. Through all of his accomplishments and experiences, he has learned many valuable things and grown as a musician over the years. Shawn is currently attending the University of Hawaii at Manoa in order to achieve a higher education for the future. He will continue to grow as a musician, sharing his knowledge and skill with other aspiring drummers. Shawn is a easy going and great communicator. He was a personal student of mine from the age of 10 years old till he graduated high school. Shawn has a strong background with the Hawaii Youth Symphony program. Not only is Shawn a good musician, but he has a positive outlook, and is good role model for his students. Sherwin Corpuz is a well-rounded musician. Althought Sherwin started taking piano lessons at the age of 6 years old and choir at the Haleiwa Baptist church, his passion for music was triggered in high school. Sherwin delved into singing, guitar, piano, and song writing as a hobby while aspiring to be an architect. During college at UH Manoa, he performed with several local rock bands, Hawaiian bands, and musical productions. His passion for music steered him away from an architect degree and instead graduated with a Bachelors of Music Emphasis in guitar. Sherwin has taught piano, voice, guitar, bass and theory since 2004. These days he quietly plays for his church and occasional functions. He has written several pieces and plays a lot of his churches original music. He enjoys teaching music because he feels greatly rewarded to instill music passion in others. He considers himself a teacher of life and is also passionate about health, sports and being drug and alcohol free. He has a sense of humor and wit that makes learning music fun. An example of this: Sherwin created an acronym that helps local beginners to remember alphabets "a" through "g" backwards as a means to read music. GFEDCBAG. "Go Fo Eat Dinna Cause Bambai All Gone". A career musician, music teacher, and former accounting professional. For 30 years, focused on corporate accounting/finance for profit and non-profit entities. Participated in management team decision making towards achieving its company mission statement. Assisted organizations to be successful with regard to viability and profitability. Presently on a different career path, passionately dedicated to music education. Teaching students to be successful in discovering the joys of music. Also helping them to develop good self-esteem, self-confidence, and apply the skills and discipline of learning music to other facets of their lives, aspirations, and future endeavors. Timothy Abrigo is the lead instrumentalist for, and head of the three time Na Hoku Hanohanofinalist band known as the Abrigo ‘Ohana. He has been performing live for more than ten years in the islands and abroad. As a performer and instructor, he is a master of Hawaiian Slack Key Guitar (Ki Ho’alu) playing and performing in multiple tunings, Hawaiian Steel Guitar (Kika Kila) also in multiple tunings, Slack Key Ukulele in multiple tunings, standard tuning guitar, standard tuning ukulele, bass guitar, and banjo. A featured artist for many prestigious events such as the Aloha International Steel Guitar Convention, lead guitarist for Aulani Starlit Hui Show, performer and instructor for the Kahumoku 'Ohana Hawaiian Music and Lifestyle Workshop, host of the Waimea Valley and Bishop Museum Kanikapilas, and with multiple ukulele competition wins under his belt, Timi is also well known for his ability to teach all stages of musicians, beginners through advanced with light hearted enthusiasm and a “can do” attitude. With great appreciation for many genres of music, Timi’s favorites to teach and perform include Hawaiian, Country, Rock and Roll, and Easy Listening. Timi also is a certified audio engineer, and has mixed and master all of his band’s CDs. Timothy Vigilla Jr. has had a passion for music throughout his life, first sparked by his parents, who had given him a tiny toy piano at 4 years old. His dad loved to sing listen to Elvis songs, and play the ukulele. In Tim’s early years, going through elementary school, he had the privilege of learning the basics of music, primarily the ukulele as a part of the ukulele club with music teacher, Ruth Komatsu at Kalihi-Kai Elementary School. Later continuing his learning as a French horn section leader at Kalakaua Middle School, expanding his experiences of note reading, rhythm, performance, and most importantly learning the value of great mentorship, teamwork, and leadership modeled after band director Kent Miyashiro and Alan Ing. Farrington High School is where Tim found a passion of playing the guitar. Farrington band/guitar instructor, Charley Regua, taught the value of chords/strumming, rhythm, circle of fifths, major chord families. He encouraged responsibility, independent practice, discovering new music, and individual and group performance. Farrington High School is where Tim also connected with friends and other musicians. Discovering a love for writing music, he eventually broke through his comfort zone performing on stage, learning about music production, making music videos, entering contests, such as Band Champ, and Brown Bags to Stardom. Since then, he has partnered with and worked with other professionals in the music industry, such as Brett Ortone, Imua Garza, and has had performances solo, and with groups such as his main group, “Everyday Aloha,” with his voice, guitar, ukulele, as his primary instruments. Tim has also graduated with a degree in music performance, from University of Hawaii at Manoa. He has had the privilege of having a voice instructor such as Dr. John Mount, and choir director, Miguel Felipe. He continues to seek mentorship in all aspects of his life, and seeks to be a better example to his students, fellow teachers, and most importantly his family. Tim currently teaches ukulele, guitar, voice, and piano at the Waipahu location, and stadium location.